We had a chili cook-off at church but we ended up not going for a few reasons. I have been wanting to make a chili with chicken. I found a recipe that sounded good on allrecipes.com, White Bean Chicken Chili. It has a very Tex-Mex flavor. I thought it was good. Kade dressed the part. That sounds yummy. 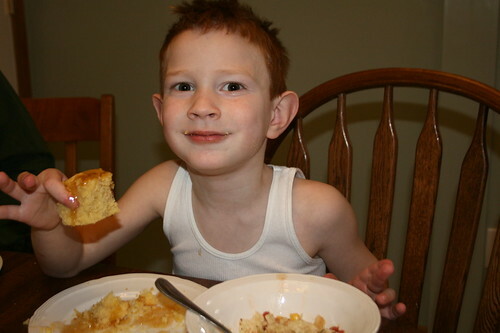 How about a good cornbread recipe? Here's the corn bread recipe: 1 box Jiffy Corn Bread Mix combined with the recipe on the back of the Quaker Yellow Corn Meal container. Sometimes I use natural applesauce in place of half the oil. With the chili being spicy the corn bread tasted so sweet. It was a nice combination. I forgot to mention above that you also need to add the egg and milk needed to make the Jiffy Cornbread. Going Out like a Lion?